Social media giants Facebook Inc. and Twitter Inc. should be fined if they don’t weed out automated accounts, or bots, trying to influence U.S. public opinion, said Democratic Senator Amy Klobuchar. “I think that would be a great idea,” Klobuchar, of Minnesota, said on NBC’s “Meet the Press” on Sunday when asked whether the companies should face fines if they fail to act after the government discovers the bots. Just one big bag of criminal baloney. Globalist Crime Syndicate wants to censor open global discussion becuse the garbage they spew on their mainstream propaganda networks isn’t working so well. Isn’t that just too bad, hypocrite. I’m sure you’ll censor this True News also. Frim Time Magazine cover story. 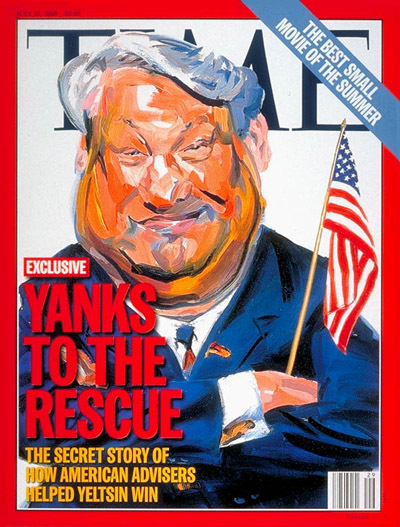 THE SECRET STORY OF HOW FOUR U.S. ADVISERS USED POLLS, FOCUS GROUPS, NEGATIVE ADS AND ALL THE OTHER TECHNIQUES OF AMERICAN CAMPAIGNING TO HELP BORIS YELTSIN WIN.